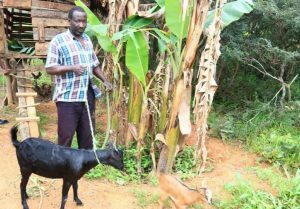 St Michael’s Parish in Chitipa has purchased 30 acres of land for livestock and crop production as one was one way of generating income for the running of the parish. St Michael’s Parish, as most of the parishes in the Diocese of Karonga, is in a remote area where most of the Christians are poor subsistence farmers. Nevertheless, the parish leads, among the parishes in the Diocese of Karonga, in terms of the number of income generating activities that supplement the contributions from Christians in the running of the parish. Parish Priest for St Michael’s Parish Father Charles Chinula hailed the dedication of the faithful in their drive towards building a self-reliant Church which has also made this project a reality. He further said that for the Church needs financial resources to effectively carry out its mission of spreading Good news for the salvation of souls. This he said brings about the need for diversifying sources of income other than relying on goodwill contributions of Christians which do not steadily flow. Farm operations are expected to start soon in preparation for the next growing season. Among others, St Michael’s Parish has St. Kizito Conference Centre, a maize mill and a 15 tonne lorry as major income generating activities.